Cactus Flower Florists: Hanukkah is December 7th! ** A gift of food is always welcome. A fruit basket would be perfect as it does not cause problems with kosher food laws. **A lovely centerpiece can grace the dining room table. Traditionally, white, blue and silver are the colors used for this celebration. Do not include candles, so as not to take away from the importance of the mennorah. 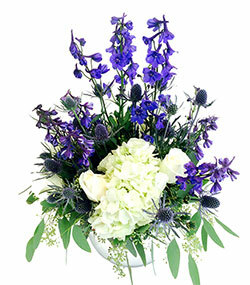 ** Floral arrangements that reflect the recipient's home are great gifts as well. If you do not know the color scheme inside her home, stick with the white and blue palette, such as CFE290 Boy Oh Boy. ** A nice green plant trimmed with a blue and/or silver bow would also be appreciated and lasts long after the holiday. A few rules to follow for Hanukkah gift giving. . .
Do not send anything that conveys traditional Christmas holiday, such as red and green arrangements, or things including red and white striped candy canes, ornaments, crosses or other religious items. If sending a plant, stay away from poinsettias and anything pine or Christmas-tree shaped. Make sure that when placing the order you mention it is a Hanukkah gift, as it must arrive before sundown!